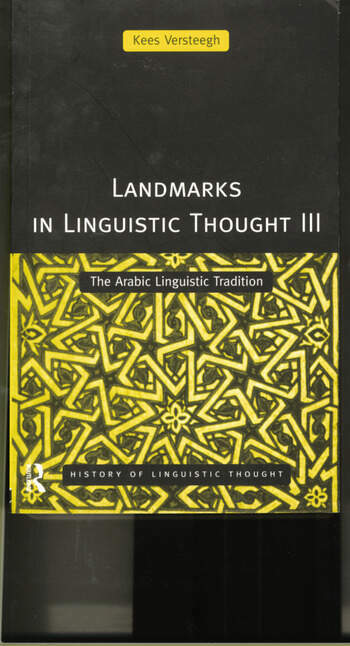 Landmarks in Linguistic Thought Vol 3 is devoted to a linguistic tradition that lies outside the Western mainstream, namely that of the Middle East. The reader is introduced to the major issues and themes that have determined the development of the Arabic linguistic tradition. Each chapter contains a short extract from a translated `landmark' text followed by a commentary which places the text in its social and intellectual context. The chosen texts frequently offer scope for comparison with the Western tradition. By contrasting the two systems, the Western and the Middle Eastern, this book serves to highlight the characteristics of two very different systems and thus stimulate new ideas about the history of linguistics.